There are a variety of woods used for making fine violins, including Maple, Spruce, Ebony, Boxwood, Willow, Poplar and Rosewood. Old growth trees from higher altitudes are preferable to violinmakers because the wood is harder, stronger and denser. Trees are chopped down in the winter months and seasoned by cutting billets and storing them in a cool place for many years. This drying / aging process preserves the cell structure in the wood and eliminates deposits of moisture, compacting the wood. Maple, or sometimes Poplar, is used for the back, ribs, neck, bridge and scroll. Maple from the Yugoslav region of Europe is considered the best, because it is known to be lighter than American Maple. The “flame” effect is an appealing visual feature of Maple, formed by the ripple-pattern growths of fibers in the trees. Cut Maple reveals the wavy pattern of light and dark “flames” in the wood structure. Matching the ripples in the Maple throughout the parts of the violin gives it an attractive look and may enhance the quality of the sound. 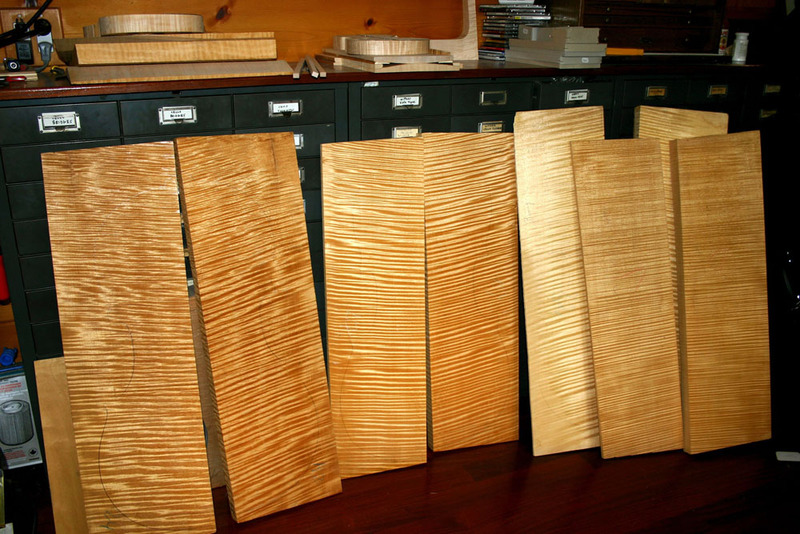 Spruce is a soft tonewood with a high stiffness-to-weight ratio and is used for the top, or front, of the violin, as well as the bass bar and sound posts. When the strings vibrate sound waves into the body of the violin, a quality spruce top is imperative for optimal acoustics. Visually, spruce has fine vertical grains that appear on the front of the violin. Spruce or Willow is also best for the internal blocks and lining. Fingerboards, pegs, tailpieces and end pins need to be made out of a dense hardwood, commonly Ebony. 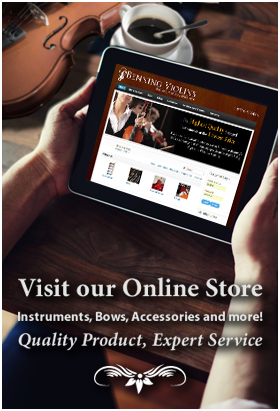 Of all hardwoods, Ebony is the strongest, and its black coloring is desirable to create the look of the violin. Rosewood, Boxwood and certain Mahoganies can also be used, but are not as enduring.